Only one photo tagged with Wellingborough. If you have one, why not upload it? 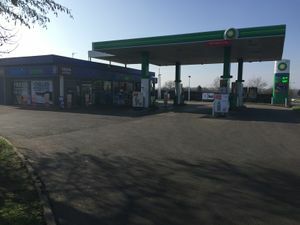 A petrol station and motorhome store on the A45. The filling station was called Seamarks Garage and was formerly operated by Snax 24, and before that Petrofina (later Total). It was built in the 1960s, and a restaurant was added. There were several plans to re-build it in the 1980s, which resulted in a Kelly's Kitchen opening here, which became a Little Chef and closed in 2001 to become the motorhome centre.